Now available for sale and at-home use! "These materials helped me learn more Spanish than anything I'd used before - and believe me, I'd used lots of materials - online programs, textbooks, apps, you name it! This is by far the best system I've used. ​I've just finished the Beginner level, and I'm excited to complete the whole series on my own." Click slideshows to preview content! 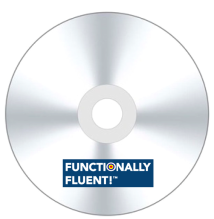 BUY FUNCTIONALLY FLUENT! ​ ​SYSTEM & MATERIALS! Learn to do 25 things in Spanish per level with our program, or your money back! ​making you functionally fluent in Spanish! HABLA's Functionally Fluent! program consistently receives rave reviews! Created by HABLA owner Diana Gruber, who speaks six languages fluently and has been teaching for over twenty years, our program is backed by a real-life school and has made thousands of Americans fluent in Spanish. Students report these are the best materials they've ever used for language-learning, and that the value far exceeds the price. In fact, we guarantee you'll learn more Spanish with Functionally Fluent! 's system than with any tool you've used before - or your money back! The series consists of five levels - Beginners-1, Beginners-2, Intermediate-1, Intermediate-2 and Advanced. The program is designed for professional adult learners who want to connect with Spanish-speakers in their lives, in the US and abroad. We know many interactions with Spanish-speakers happen at work, so we've created supplements like Spanish for Lawyers, Spanish for Nurses and Medical Professionals, Spanish for Business, Spanish for Teachers, Spanish for Missionaries and Non-Profits, Spanish for Travelers, Spanish for Construction, and others. The books are graphically rich, streamlined, and non-intimidating. Check out the format in the sample pages above, including fun dialogs, funny excerpts, and engaging photos. The approach is organized and empowering - at the end of each chapter and level, you'll check off the things you've learned to do in Spanish - introduce yourself, order a meal, tell a story, make future plans, and much more! The accompanying audio CDs provide an essential pronunciation component, and are great for reviewing in your car or home. Functionally Fluent! is also being expanded to other languages - click here to learn French, learn Italian, learn German, learn Portuguese, learn English (ESL - English as a Second Language), and more. How to Use Functionally Fluent! Our #1 recommendation for Houston learners is to take our Houston Spanish Classes. The books are an essential part of HABLA's seminars, and are included in class pricing. Register now for an HABLA class, which includes one book per level. Spanish teachers, tutors, and groups of learners can purchase our materials for use anywhere in the world. Public school educators can purchase them to use alongside their school's core curriculum. Many students report learning faster with our system than with any other, and we'd love to help improve language-teaching methods in American schools. Put together some amigos and study with our materials. Grab a co-worker and "buddy up" with our program over lunch. Recruit a Spanish-speaker in your life to help you. Buy our system and have a tutor you guide you in person or via Skype. Setting this up will be surprisingly easy - our books have step-by-step instructions for assimilating, repeating, practicing and reviewing specific language structures. We "take you by the hand" and "feed" you exactly the language you need to succeed. We'll provide the structure and the content, if you'll provide the interactive context - it's a win-win! Nowadays, many self-guided learners are experimenting with software, apps, and other online methods. Learner feedback shows these programs are not usually successful at making learners fluent. At best, they help build vocabulary and encourage a passive understanding, but few users actually become fluent. Functionally Fluent! is different - we guarantee we will make you "functionally fluent" - or your money back! Even outside of a class environment, our program has built-in components that make it easy for you to practice speaking Spanish in real-life. You won't just listen and repeat into a microphone - you'll be guided through truly interactive exercises to help you engage with real people! When using our program for self-study, you'll see we have the best content and structure of any program on the market, and we offer you guidance in English, so there's no frustration or guesswork! We enable you to absorb Spanish at your own pace, and provide you with tools to practice later with people in your life! No matter how you use our materials, we're confident you'll learn more Spanish with the Functionally Fluent! system than with any other Spanish-learning tool you've used before! Our students love us, and you will too - or your money back! ​Start learning Spanish today with Functionally Fluent!